In the early 1990s, Napier produced an astonishing line of high-end fashion jewelry designs using extremely expensive Swarovski crystal rhinestones that were hand set. These pieces originally retailed up to $250.00 each. In today’s 2013 dollars, this amount equates to over $423.00. 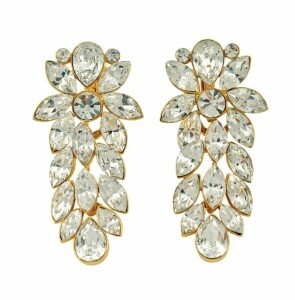 The earrings below are from a dazzling 1991 collection. Additional information about this line including the matching necklace and the head designer is featured in my book. These earrings were designed by, Denise Wood, who was part of the Napier design team from 1990 to 1995.